I was on the brink of giving up on Christianity altogether—completely exhausted and frustrated with the restrictive and exclusive nature of the traditional Church. I was angry, repulsed and often felt cheated by the church. Metaphorically, I felt entrapped by the shell I had been incubated in, and I had to get out. The day after a major meltdown, when I told my wife I was through with God and through with the Church, I called my life coach who had gone through the same experience, and he recommended this book. Wether it was just timing, or timeless truth, I do not know, but I have never been so thankful for a book in my entire life. This book spoke to my sufferings in my personal life over the last 4 years, and to my spiritual frustrations with the Church. 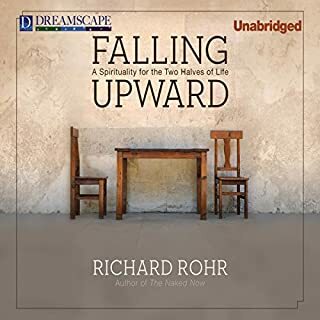 It was like a guide on life's journey as Rohr talks about in his book. It gave me an appreciation for the Traditional Church in my life, and yet freed me from it at the same time. It gave me a deeper understanding of God's love in all stages of life, and the need to keep moving in my Faith. I've never felt the kind of peace, joy and love from God as I do after hearing this. Rohr's understanding of scripture (and literature!! Which I loved as an English Major) was extraordinary, exciting and enlightening. I highly recommend this book to everyone, but I will also say that no one will get as much out of this as those who are questioning the traditional Church or have reached a spiritual roadblock in their life.